astronomical knowledge in the ancient Vedic civilization. The Middle Ages certainly saw many conflicting and poorly defined standards of weights and measures. But exact standards of measurement are not solely a modern invention. Consider this example. In tenth-century England, King Athelstan decreed that the king's girth, in which the king's peace is in force, should extend from the royal residence for a distance of 3 miles, 3 furlongs, 9 acres, 9 feet, 9 palms, and 9 barleycorns. This sounds quaint. But it defines a circle with a diameter of 36,500 feet almost exactly 1/10 of a degree of latitude in southern England. To define a unit of length exactly, it is natural to use latitude as a standard, because latitude derives from the size of the earth, a constant that can be measured astronomically. So if a fire or invasion destroys the standard measuring rod stored in some government building, astronomical readings can be used to restore the lost standard. Of course, it seems unlikely that accurate astronomical measurements were being made in England in the days of King Athelstan. But if we look into the history of weights and measures, we find that distances were gauged in terms of latitude in ancient times, and medieval societies inherited many exact standards of measurement. These included volumes defined as length cubed and weights defined by filling such a volume with water. 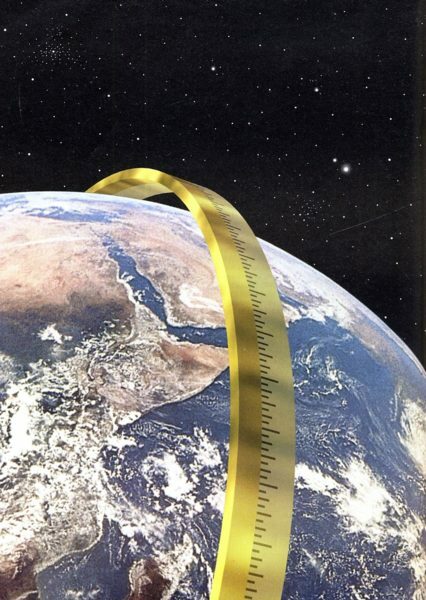 The Greek astronomer Eratosthenes is usually credited with being the first to measure the size of the earth by observing latitudes (see Figure 1). He is said to have noted that the sun, when directly overhead at Syene at the Tropic of Cancer, casts a shadow of 7.2 degrees at Alexandria. Knowing the distance between Syene and Alexandria, he could compute the length of a degree of latitude and estimate the circumference of the earth. But there is reason to believe that the size of the earth was known long before Eratosthenes. The Italian scholar Livio Stecchini has given extensive evidence that the ancient Egyptians laid out their country using latitude and longitude. He argues that they had accurate knowledge of the dimensions of the earth and that such knowledge was inherent in the design of the great pyramid at Giza. Since the great pyramid dates to about 2500 B.C., this implies that the earth was measured scientifically at least that long ago. Turning to India, we find a unit of distance called the yojana that at first glance seems as ill defined as the medieval English furlong or foot. The yojana is defined to be either 16,000 or 32,000 hastas, where ahasta, or cubit, is 24 angulas, or fingers. That there were at least two sizes for the yojana is upheld by the writings of classical Indian astronomers. The fifth-century astronomer Aryabhata used a yojana of about 8 miles, and the astronomy text Surya-siddhanta a yojana of roughly 5 miles. The first hint of the ancient history of the yojana comes from Strabo, who describes the experiences of Megasthenes, a Greek ambassador to India in the period following Alexander the Great. Strabo cites Megasthenes as saying that along the royal road to the Indian capital of Palibothra (thought to be modern Patna), pillars were set up every 10 stadia (see Figure 2). The British scholar Alexander Cunningham argues that the pillars marked an interval of one krosa. Since there are traditionally 4 krosas per yojana, this implies 40 stadia per yojana. Stecchini gives 400 cubits per stadium, and this implies 16,000 cubits per yojana. Since the smaller of the two definitions for the yojana assigns it 16,000 hastas, we can tentatively identify the hasta, or Indian cubit, with the Greek cubit. This unit is well known, and it enables us to compute the length of the yojana. The Greek cubit is 462.42 millimeters. This gives us a small yojana of about 4.6 miles, in rough agreement with texts such as the Surya-siddhanta. Stecchini points out that the stadium was defined as 1/600 of a degree of latitude. This would mean that there are 15 small yojanas per degree. Likewise, there are 60 krosas per degree, or 1 krosa per minute. Here we must make a technical observation about latitudes. Consider the earth to be a sphere, rotating on a line through the north and south poles called the polar axis. The latitude of a person facing north at some point in the northern hemisphere is the angle from his horizon up to the polar axis (see Figure 3). That angle is 0 degrees at the equator and grows to 90 degrees at the North Pole. The length of a degree of latitude is the distance a person would have to travel north for his latitude to increase by 1 degree. On a perfect sphere, this distance would be the same at all latitudes. But the earth is slightly flat at the poles and bulges at the equator. This makes for a degree of latitude slightly smaller at the equator than further north (see Figure 4). Stecchini noted that the Greek stadium is 1/600 of a degree of latitude at Mycenae in Greece, and he argued that it was deliberately defined this way in ancient times. I propose that to define the yojana in India the degree of latitude at the equator was used. This means that the hasta should be 460.7 millimeters instead of 462.4 millimeters (and the yojana would still be about 4.6 miles). I shall point out below why this fine distinction is important. At first glance, the yojana of 32,000 hastas should be twice as long as this, or about 9.2 miles. But there is reason to think that these two yojanas use different standards for the hasta (see Figures 5 and 6). Hiuen Thsang, a Buddhist pilgrim who visited India in the seventh century, wrote of yojanas in terms of a Chinese unit of measure called the li. He reported that a yojana consisted of 40 li according to Indian tradition but the measure in customary use equaled 30 li and the measure given in sacred texts was only 16. The li has taken on many values during China's history. But using values for the Thang dynasty, when Hiuen Thsang lived, we can compute that the yojana of 16 li matches the small yojana of 4.6 miles. Could the yojana of 30 li match the larger yojana of 32,000 hastas? If it does, then the larger yojana has to use a slightly smaller hasta, 30/32 as long as the hasta in the shorter yojana. Multiplying our hasta of 460.7 millimeters by 30/32, we get a smaller hasta of 431.9 millimeters. The larger yojana of 32,000 hastas then comes to 8.59 miles. At the equator, that is 1/8 of a degree of latitude. In an investigation to be reported in a later article, I found that the geocentric orbits of the planets Mercury, Venus, Mars, Jupiter, and Saturn align closely with the dimensions of dvipas in Bhumandala. Bhumandala and dvipas are features of cosmic geography defined in the Fifth Canto of the Srimad-Bhagavatam. To align planetary orbits with dvipas we need to be able to convert the yojanas used in the Bhagavatam into the miles or kilometers of modern astronomy. I found that the alignment of orbits and dvipas works well if we assume about 8-1/8 miles per yojana. To compare orbits with the structure of Bhumandala, I used modern ephemeris programs for orbital calculations. I was most interested in the epoch of about 3000 B.C., the traditional time of Krsna's manifest pastimes on earth, as described in the Bhagavatam. It turns out that at this epoch the planetary orbits align closely with dvipas in Bhumandala at a sharply defined value of 8.575 miles per yojana. This is very close to the figure of 8.59 miles based on the hasta of 432 millimeters. So the value of the yojana we get by historical research is confirmed by completely independent calculations having to do with planetary orbits and the astronomy of the Bhagavatam. As explained above, we get the larger yojana of 32,000 hastas (and 1/8 of a degree of latitude) by using a hasta of 431.9 millimeters. This can be rounded off to 432, a familiar number in Vedic literature. (For example, 432,000 is the number of years in Kali-yuga, the current age.) It turns out that this familiar number may not be simply coincidental. First of all, the meter itself derives from a measurement of latitude. The meter (one thousand millimeters) was originally defined in 1791 as 1 ten-millionth of the distance from the equator to the north pole through the meridian of Paris. That distance has been remeasured since then, but the change amounts to a tiny fraction of a percent. These observations suggest a simple experiment. Try setting the mean diameter of the earth to exactly 1,728 small yojanas of 16,000 hastas. Suppose that 30/32 of a hasta gives a smaller hasta exactly 108 ten-billionths of the circumference of the earth through the poles. If we multiply it all out, we find that the ratio between circumference and mean diameter comes to 3.13967. This ratio expresses the degree of polar flattening of the earth (see Figure 8). (If the earth were a perfect sphere, the number would be p the ratio of the circumference of a circle to its diameter.) As it turns out, 3.13967 is within 0.006% of the actual ratio, as calculated using modern data. That this calculation works out so well indicates strongly that we are dealing with design rather than coincidence. In summary, simple arguments from the testimony of Megasthenes and Hiuen Thsang enable us to reconstruct two closely related yojana values. Both are precisely defined as fractions of a degree of latitude at the equator. Both relate to the earth by multiples of 108 (namely 432 and 1728), and this relationship gives us a very accurate estimate of the polar flattening of the earth. Also, the length of the larger yojana is confirmed independently by an investigation comparing modern astronomy with the cosmology of the Bhagavatam. Let us return briefly to our replacement of the Greek cubit with a slightly smaller unit linked to a degree of latitude at the equator. All the calculations above would go through if we used the Greek cubit directly and did not make this substitution. But the errors would be larger. So I prefer to match the two yojana lengths to the equator rather than to Greece. Curiously, we can find support for this in the design of the great pyramid of Egypt (see Figure 9). In 1925 an engineer named J. H. Cole made an accurate survey of the great pyramid using up-to-date instruments. He found that twice the perimeter is 1,842.91 meters. For comparison, a minute of latitude at the equator or 1 krosa of the small yojana is 1,842.93 meters. In other words, the perimeter of the great pyramid is almost exactly ½ krosa. Likewise, we find that the hasta of the small yojana goes almost exactly 500 times into each of the sides of the pyramid. The Greek cubit and stadium, however, fit the pyramid less closely. (There is a 0.4% error.) So it would seem that the great pyramid was designed using units linked to the degree of latitude at the equator. There is a further astronomical support for the length of the larger yojana. If we divide an up-to-date value for the distance from the earth to the sun by this length, the result is 10,821.6 thousand yojanas. This figure is close to 10,800, another multiple of the familiar 108. In a later article, I will show that this distance also fits naturally into the system of dvipas in Bhumandala, and I will also give many examples of 108 in astronomy. If the yojana was exactly defined as a fraction of the equatorial degree of latitude, then the people who defined it must have known that the earth is a globe. Indeed, they appear to have understood the dimensions of the earth's equatorial bulge. Who were these people, and when did they live? The evidence considered here puts them at least as far back as the time of the great pyramid a time when people supposedly believed that the earth is flat. Yet the correlation between planetary orbits and features of Bhumandala shows that the "earth mandala" of the Bhagavatam was far from being a naive flat earth. Its connection with planetary orbits shows that Bhumandala represents the plane of the solar system, which (if we discount the slight inclinations of the planetary orbits) is actually flat. The Bhagavatam speaks of an ancient Vedic world civilization. Although the evidence we have looked at here does not prove that such a civilization existed, it does show that some people in the distant past attained an unexpectedly high level of scientific knowledge. Whether they lived in the East, the West, or both is hard to say. We do know that some evidence for this civilization is preserved in texts from India such as the Srimad-Bhagavatam, and other evidence may be found in ancient ruins of the West. Perhaps there was an advanced civilization that was worldwide in its influence. It is worth our while to be on the alert for other evidence that may shed light on this hidden chapter in human history. Sadaputa Dasa (Richard L. Thompson) earned his Ph.D. in mathematics from Cornell University. He is the author of several books, of which the most recent is Alien Identities: Ancient Insights into Modern UFO Phenomena.